When I set out to create a Pesach stir-fry, I assumed the hardest part would be creating the noodles. What I didn’t realize is that all the classic sauces you would normally use in a stir-fry are either not Kosher for Passover (KFP) or contain kitnyot, which I don’t eat on Pesach. That ruled out soy sauce, teriyaki, mirin, rice vinegar, hoisin sauce, miso, and sesame oil, along with all the other sauces which could technically be KFP but just don’t seem to have a hechsher, like tamarind paste. So what did that leave me with? Absolutely nothing! Of course, I have all the usual sweeteners like honey, silan, and brown sugar, and almost all regular spices, but where was I supposed to get that distinct umami taste from? So, I decided to make it myself! Since then, I found out that some stores in America actually do sell KFP soy sauce, so if you have that option nearby definitely go for that. I do not, so I set out to create it from scratch. After I got the soys sauce recipe as close as I possibly could to the original using only KFP products, I moved on to the stir-fry itself. For the noodles, I decided to go with my mom’s classic egg lockshen that I practically grew up on. 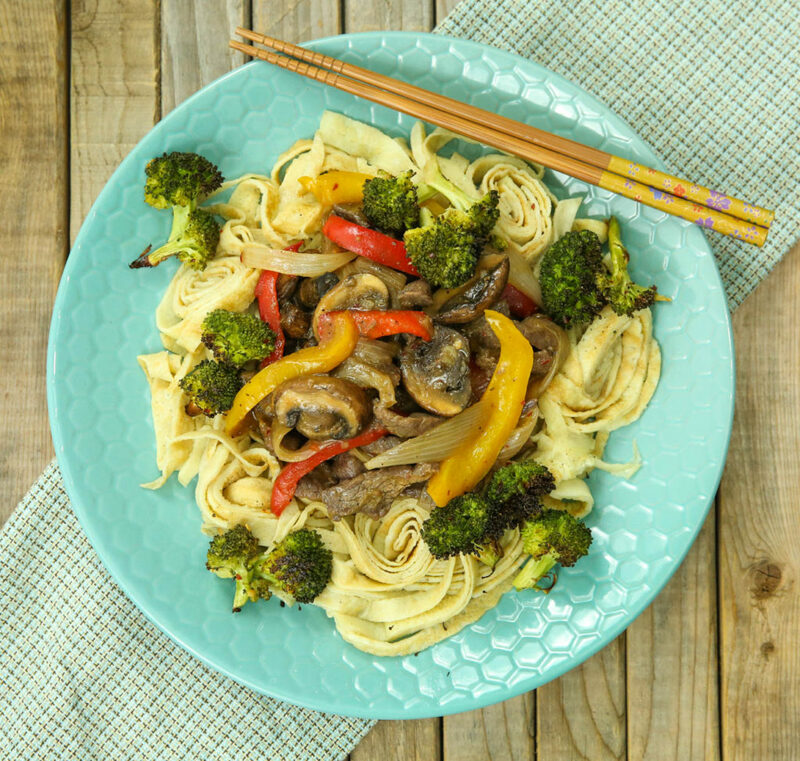 She usually serves it in a soup, but these egg noodles are actually so versatile that they work for this stir-fry, for soup, or as a the base for a cheesy pasta! 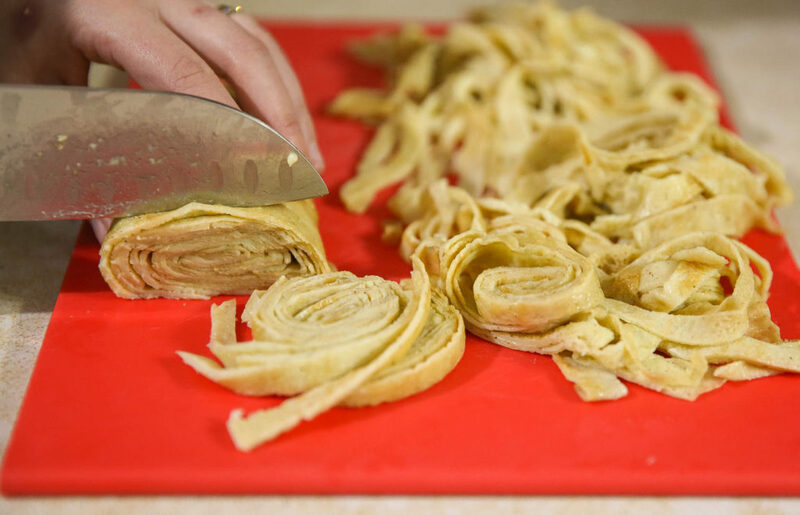 They also roll up great and can be stuffed with potatoes to make blintzes, best topped with a mushroom sauce. Unfortunately for us, testing these recipes out weeks before Pesach means we’re eating chametz-free food way before we really need to! So to keep that to a minimum, I decided to also boil up a pot of pasta for us to eat once I was done with the pictures. Before I served the stir-fry over real spaghetti, we took a few bites of the dish with the egg noodles and we totally forgot about the real pasta, it was that good! The hubby ended up taking the real pasta for lunch the next day because the whole Passover stir-fry with egg noodles was devoured at dinner. And it’s not even gebrokts! Heat up a large sauté pan over medium flame. Once hot, add in the meat. Brown on both sides, depending how thin it should be between 2-4 minutes, and remove to a plate. Add in the onions to the same pan and sauté until golden. Add in the garlic and mushrooms and sauté until fragrant and the mushrooms have started to reduce. Add in the peppers and sauté just until starting to soften. Add in the soy sauce and slowly drizzle in the potato starch slurry, mixing it in as it's poured in. Allow the sauce to thicken, 1-2 minutes, then add back in the meat. Add in the sherry, honey, salt and crushed red pepper if you like it spicy. 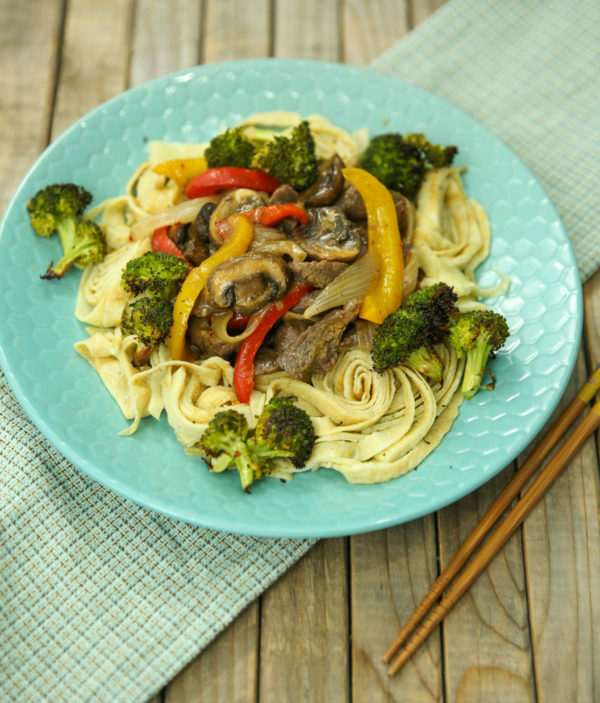 Place the noodles on individual plates and serve the stir fry on top, with roasted broccoli on the side. Cut up and clean one broccoli head. Place on a parchment lined baking sheet and drizzle with olive oil. Sprinkle sea salt, freshly cracked black pepper, sumac and crushed red pepper for heat. Bake at 400 F until crispy. While this doesn’t taste like your average soy sauce, it's a close Passover copy. On it's own it tastes less like soy sauce but mixed into a stir fry it gives that perfect umami taste! Place everything but the salt in a small sauce pan. Heat up over a medium flame and constantly whisk so that the flavors meld. Once simmering add the salt to taste. Simmer for 10-15 minutes until reduced by half. Should yield around 1/3-1/2 cup soy sauce, perfect for the Passover stir-fry. *If you cant find KFP then you can make your own or use water with powder. **Place 5 dried mushrooms in a measuring cup and pour 2 cups boiling water over it, cover with saran wrap and let sit for 1/2 an hour. Remove the mushrooms and use the broth, save the extra broth for a different soup. Whisk the eggs until fluffy. Add 1/2 cup potato starch, the water, salt and pepper and whisk well. It should resemble batter for an omelet. If the mixture is too liquidy add in another tablespoon potato starch at a time. If the mixture is too thick add in one tablespoon of water at a time. You should need more than 1 or 2 in either direction. Heat up a large nonstick frying pan and spray with cooking oil. Right before ladling out more batter to fry always give the mixture a good stir as the potato starch will settle down at the bottom. Add a spoonful of batter to the pan, creating a very thin circle. Fry for 2-3 minutes until very yellow with a hint of gold and then flip to the other side. Fry for another 2-3 minutes and remove to a plate. Repeat until all the batter is done. 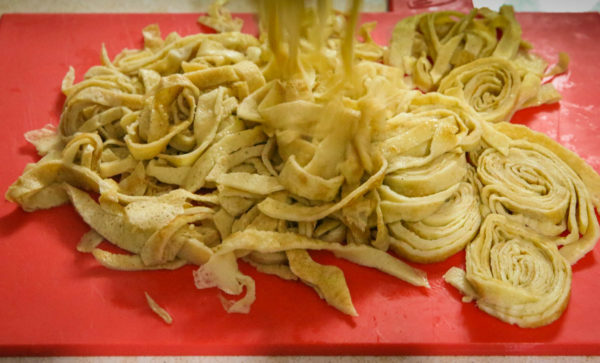 To create the noodles, take your stack of egg pancakes and roll into a log as tightly as possible. Starting at one end slice thin slices to create spaghetti-like pieces. 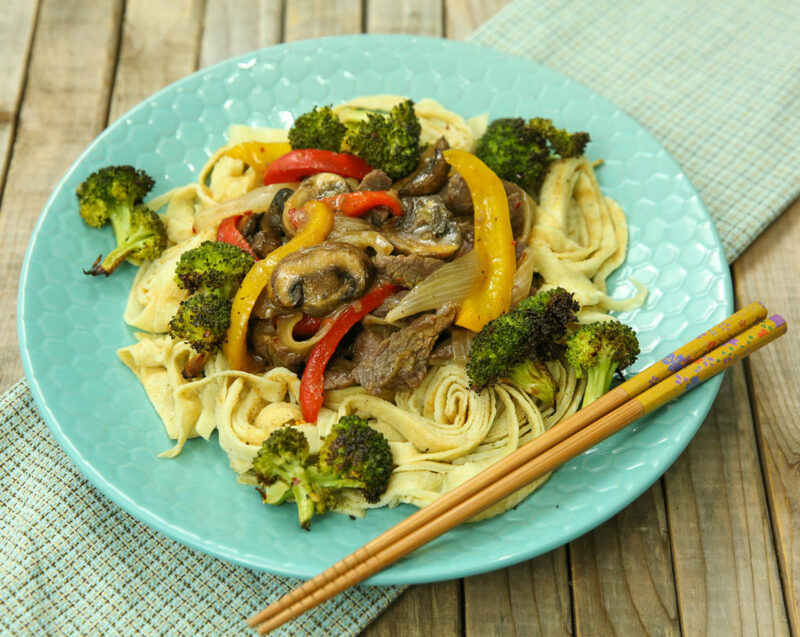 Use in soup, as a base for a stir fry or even top with cheese!